In this post, we’re going to take a look at the D in CRUD: Delete. We use the DBD::Oracle driver to delete some data in the database tables, using the connection object created in the Initial Setup section of the first post in this series. My helper function get_all_rows encapsulates a select statement used to verify that the deletes worked. The select functionality is covered in the R part of this series, so I won’t go into the details here. #Adding some space around the results to make better screenshots. 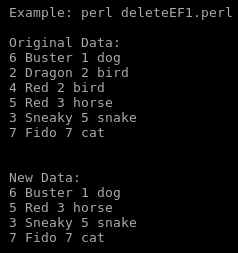 First, let’s run reset_data.perl to set up our data. We will perform a simple delete that removes a single record from the lcs_people table. These are the steps performed in the code snippet below. Prepare a SQL DELETE statement, deleting the record with an id of 1. Now is a good time to run reset_data.perl. 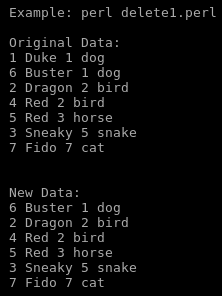 In our design, we have a Foreign Key constraint in lcs_pets that ensures if a pet has an owner, that owner exists. If we attempt to delete a record in lcs_people that is referenced in lcs_pets (Person has a pet,) we get an error. DBD::Oracle::st execute failed: ORA-02292: integrity constraint (BLAINE.FK_LCS_PETS_OWNER) violated - child record found (DBD ERROR: OCIStmtExecute) [for Statement "delete from lcs_people where id = :id" with ParamValues: :id=1] at delete2.perl line 41. DBD::Oracle::st execute failed: ORA-02292: integrity constraint (BLAINE.FK_LCS_PETS_OWNER) violated - child record found (DBD ERROR: OCIStmtExecute) [for Statement "delete from lcs_people where id = :id" with ParamValues: :id=1] at delete2.perl line 41. DBD::Oracle::st execute failed: ORA-02292: integrity constraint (BLAINE.FK_LCS_PETS_OWNER) violated - child record found (DBD ERROR: OCIStmtExecute) [for Statement "delete from lcs_people where id = :id" with ParamValues: :id=1] at delete2.perl line 41. In either of the above scenarios, you can update the pets and set their owner to another person. Bind the new and old owner values.